Trailhead is on Bean Road in Sandwich, NH. Bean Road leaves the northwest side of Rt. 25, adjacent (to the northeast) to the junction with Rt. 25B. The trailhead is 4.6 miles up Bean Road, on the right. The trail is marked with a small trail sign and there is a small pull-off immediately before. It is located in the middle of a section of the road which runs close to the shore of Squam Lake. Bean Road can also be accessed from the north, from Center Sandwich, where it is known as Squam Lake Road. It leaves the southwest side of Rt. 113, just northwest of the junction with Rt. 109. It is 3.5 miles from Center Sandwich to the trailhead (which is on the left). Although the fire tower on Red Hill offers a much grander view of the region than does the low-elevation viewpoint from its Eagle Cliff, the Eagle Cliff viewpoint has a very unique up-close perspective on the lake, making it very different from the one on top of the hill. Both are worth a visit. The cliff is accessed by the Eagle Cliff Trail, which is maintained by the Squam Lakes Association, and travels through Forest Society land. The trail is a short but very steep and rocky trek. Leaving the pull-off, the path drops off the road shoulder and begins a moderate ascent through open forest. The trail switchbacks at first, climbing quickly and becoming gravelly and rocky. Soon, the trail heads straight up the slope at a band of ledges ahead. At the base of the ledges, an unofficial bypass path splits off to the right and may be used if the rocks are slippery, although it is harder to follow and does not avoid some of the tricky rock scrambles. The main trail bears left and attacks the ledges with some scrambling. 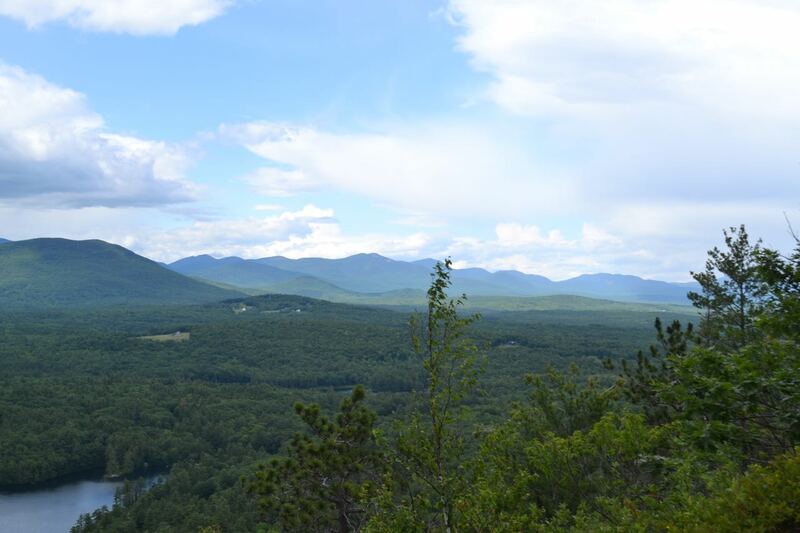 After surmounting the first band, the trail winds up along the edge of a steep slope, with more ledge climbing.It soon reaches an open ledge, where you see the steep slope below you roll away down to the lowlands around Squam Lake. The mellow Squam Range puts a backdrop against the waters. To the left, the valleys expand into the distance. To the right, you have a fairly good look at the Sandwich Range from Tripyramid to Paugus. For those hopelessly obsessed with finding all the viewpoints, just past the cliff, the trail scrambles up a large ledge with a very limited view to the south (just before the intersection with Teedee Trail). For a longer hike, the trail can be followed all the way to the summit of Red Hill.